In model year 2018, the new KTM FREERIDE 250 F replaces both the previous KTM FREERIDE 350 as well as the 2-stroke KTM FREERIDE 250 R. Equipped with a newly developed, state-of-the-art 250cc DOHC 4-stroke engine based on that of the competition Enduro KTM 250 EXC-F, it feels livelier than ever. The new powerhouse has an even more linear power delivery, with peak power remaining at the same level as before. At the same time, this smooth and nimble off-road bike remains true to the core Freeriding tenets of smooth and highly tractable performance with a linear power delivery and well-balanced torque characteristics for expressive riding. For optimum rideability, these characteristics are delivered in an especially lightweight chassis boasting agility closely approaching the levels of a true Trials bike. The new engine is also key in delivering better-than-ever handling characteristics, since it is much more compact, 20 mm shorter, and at 27.6 kg, weighs in at 1.5 kg less than its predecessor. All of this means major packaging benefits, helping to centralize masses even further. This in turn infuses riders on all skill levels with even more confidence, helping them access even more extreme terrain and traverse the toughest trails. The new KTM FREERIDE 250 F remains easy to ride in every situation, with a relatively low seat height, a compact layout and narrow body. All in all, this also makes it an excellent climber for adventurous riders looking to explore new limits and experience previously unknown degrees of freedom in extreme off-road exploration. Then there are lots of chassis updates, with the new, highly sensitive and adjustable WP Xplor suspension taking pride of place. Even easier handling and a weight reduced to less than 99 kg mean this extreme off-road bike with agile Trials capabilities is not only an awesome tool for experienced riders, but also makes for a highly rewarding and controllable introduction to off-road riding itself, with the smooth and nimble vehicle nudging new riders to begin exploring more challenging terrain without delay. Another key feature designed to help riders experience the thrill from combining the best of the Enduro and Trials worlds is, of course, minimal intrusiveness, with a small environmental footprint and especially low noise levels. The new KTM FREERIDE 250 F is homologated with 20.5 hp and 18 Nm of peak torque, which is already more than enough power to climb the steepest of slopes with ease. The unrestricted version has 26 hp and 22.1 Nm of torque. 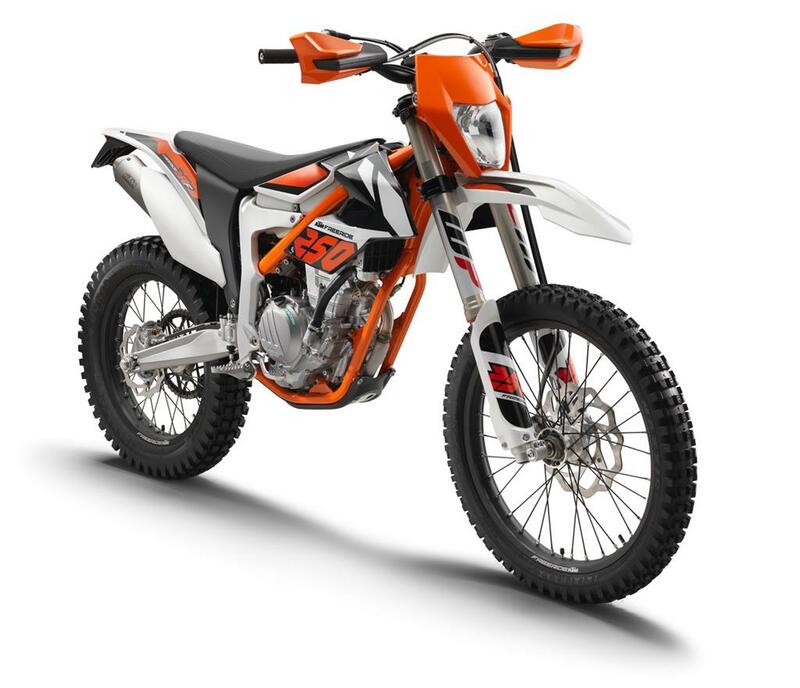 In this configuration, it also offers an alternative set of engine characteristics, as well as a traction control mode, both of which can be selected with an optional map select switch on the handlebar which is available through the KTM PowerParts catalog. The crankshaft turns a laterally mounted intermediate gear, which in turn drives the timing chain, while at the same time acting as a balancer shaft and driving the water pump. A hydraulic timing chain tensioner ensures precise and reliable valve timing. The die-cast crankcase has been designed with a much more centralized shaft configuration, moving the crankshaft closer to the bike's center of gravity while the clutch shaft position has been moved 11.1 mm to the rear and 26.9 mm up. This new engine is therefore 20 mm shorter, resulting in much more closely centralized masses as well as extended flexibility in vehicle packaging. Newly designed engine covers feature an advanced surface structure in order to reduce the wear caused by the rider's boots. The latest Keihin engine management system (EMS) with electronic fuel injection ensures a quick and powerful response, while contributing significantly to the KTM FREERIDE 250 F's low fuel consumption. Closed-loop lambda control guarantees the efficient reduction of harmful exhaust emissions using a catalytic converter in each silencer. The EMS itself boasts a faster ECU equipped with different mappings for each gear, selected according to the data received from the gear position sensor. Complementing the EMS is an all-new, 42 mm throttle body with optimized injector position, which enabled the engineers to eliminate the throttle activation linkage and shed 100 g of weight, while also providing a more sensitive throttle feel. It features idle adjustment and a separate cold start device, easily accessed from the bottom of the throttle body. The cold start button can now be conveniently deactivated by simply pushing back the throttle. The 250cc engine is effortlessly started with a reliable E-starter, mounted in a well-protected position to the rear of the cylinder. A new, lightweight lithium ion battery is used to supply power, saving approximately 1 kg of weight over a conventional lead-acid battery, while providing three times the starting energy. A new battery casing makes sure the high-tech battery is well protected, as well as making it easily accessible. The 6-speed transmission is perfectly matched to the power delivery of the 250cc engine and provides a precise and easy shifting action. The new KTM FREERIDE 250 F is equipped with the KTM "No Dirt” gear shift lever, preventing dirt from blocking the joint. A gear position sensor supplies data to the engine management system. The standard final drive ratio is 14:49, and an extra 12-tooth sprocket supplied in a separate enclosure is easily swapped in for riding in especially rough terrain. 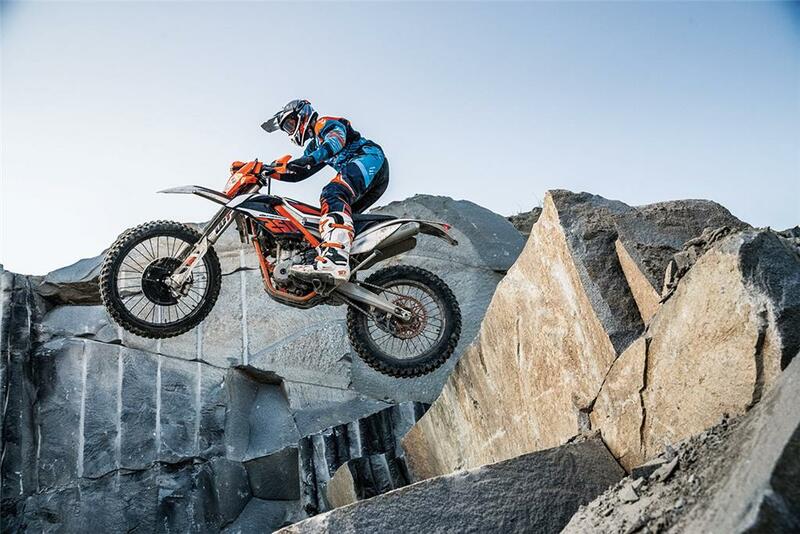 The new KTM FREERIDE 250 F benefits from the KTM-developed DS (diaphragm steel) clutch, featuring a wear-free steel basket, as well as seven highly heat-resistant steel carrier friction discs, the special design of which ensures a reliable separation and precise clutch modulation. The discs are pre-tensioned by a diaphragm spring, substantially reducing the operating force required to pull the clutch. Combined with the Formula hydraulic clutch actuator, low fatigue and precise clutch action is guaranteed at all times. The backbone of the KTM FREERIDE 250 F is the new FREERIDE frame, once again following the proven, lightweight composite design of welded, high-quality chrome-molybdenum steel sections bolted to forged aluminum components. For model year 2018 a longer steering head provides increased rigidity for even better tracking stability. New engine brackets combined with newly designed lateral engine head stays connect the engine firmly to the frame, contributing to enhanced cornering precision, while reducing vibration levels. The proven frame geometry selected for high agility with a relatively steep steering head angle and short wheelbase benefits the rider in tough terrain. By design, the 3.2 kg cast-aluminum swingarm has been given the optimum amount of flexibility in the direction of oscillation to support the suspension system comprising the frame and suspension components. At the same time, it provides high torsional rigidity for excellent stability. The WP PDS shock absorber is linked directly to the top of the swingarm with no additional linkage, making it easily accessible, while saving more weight. When designing the exhaust system, engineers focused on low noise levels and emissions as well as an outstanding torque delivery for great rideability throughout. As before the new central header is routed underneath the engine, protected by the frame and a sturdy bash plate. From there, exhaust gases are directed to the two rear aluminum silencers. 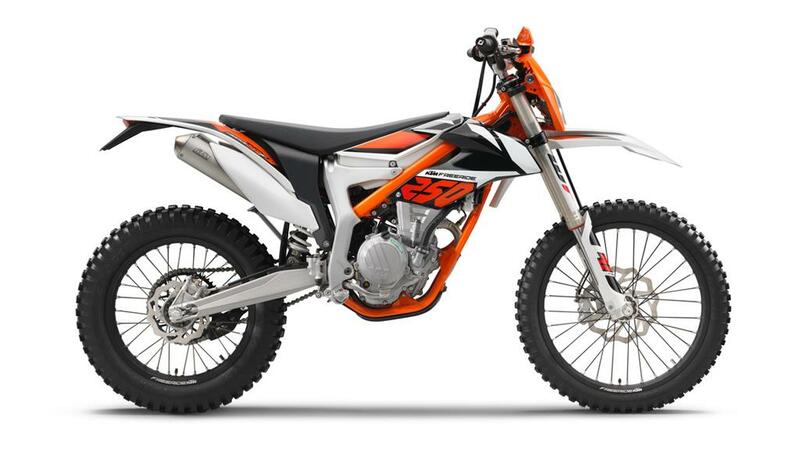 Featuring a new anthracite color and a new KTM FREERIDE logo, each of them is equipped with a catalytic converter, effectively reducing both emissions and noise to environmentally friendly levels. The cooling system routes coolant from the cylinder head directly to the radiator, which is mounted in a well-protected position behind the front frame tube. The radiator fan is now controlled directly by the EMS, obviating the need for a separate temperature switch. The new KTM FREERIDE 250 F is equipped with lightweight wheels in 21 inches front and 18 inches on the rear, featuring CNC machined hubs and newly designed, high-end aluminum rims by Giant, anodized in black and carrying a FREERIDE logo. These wheels are practically unbeatable in terms of weight, combined with the highest levels of stability. 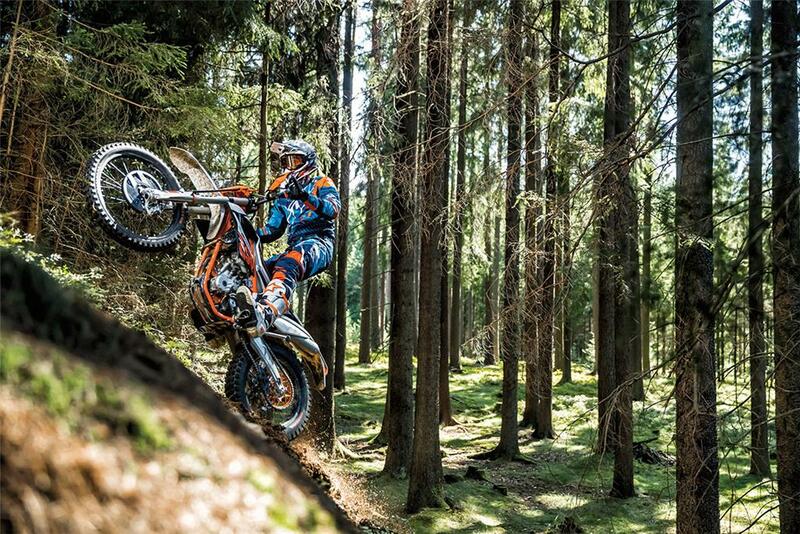 The Maxxis Trialmaxx OEM tires have been developed specifically for the KTM FREERIDE range. While delivering plenty of traction, they leave much less of an impression in the ground than conventional Enduro competition tires thanksto their high land-to-sea ratio, which means they tear up the tracks less. Their high casings provide appreciably more comfort by supporting the action of the suspension. With their soft, grippy rubber compound, these tires are also great on demanding rocky terrain and when crossing roots. The latest Formula brake system features a radial 4-piston caliper up front and a radial 2-piston caliper in the rear, perfectly matched to their 260 and 210 mm Wave brake discs. New rear brake pads make for enhanced foot brake control while the new braided front brake hose routes the speedometer cable through an integrated channel for extra protection. The new KTM FREERIDE 250 F is fitted with a newly developed WP Xplor 43 fork, an upside-down design with 43 mm inner fork tubes and 250 mm of travel. The split fork design has springs on both sides, but separate damping functions in each fork leg: compression damping is on the left and rebound on the right, avoiding any bleed-over. Damping is conveniently adjusted with great precision using dials on top of the inner fork tubes. Their outstanding response and damping characteristics give the new WP Xplor 43 an even more sensitive feel and improved resistance against bottoming out. Newly designed, CNC machined triple clamps ensure enhanced clamping of the fork, matching the lengthened steering head of the new KTM FREERIDE 250 F's frame. When combined, these new design features increase the rigidity of the complete front end for improved tracking stability. At 260 mm of wheel travel, the new WP PDS Xplor shock absorber is a perfect match for the new WP Xplor 43 fork, while saving 430 g of weight over the previous component. The proven and successful PDS rear suspension design (progressive damping system) has become something of a KTM trademark. On the WP PDS Xplor, the progressive damping is achieved by a second damping piston that uses a closed cup towards the end of the stroke, providing increased resistance against bottoming out. This design contributes to optimized progression of the complete rear suspension system, supported by a progressive spring. The suspension is adjustable in compression, rebound, and even offers separate high and low speed compression adjustment. Seat height can be lowered by 25 mm using an optional kit available through the KTM PowerParts program. The new KTM FREERIDE 250 F is fitted with a tapered Neken handlebar made of high-strength aluminum. It has the same bend as the EXC handlebar and compared to the predecessor it is slightly wider for increased leverage. The throttle assembly features a rugged aluminum body with easy free play adjustment, allowing the throttle response to be modified using an alternative throttle cam. The throttle assembly is fitted with a vulcanized grip, while the left side of the handlebar carries a convenient and safe ODI lock-on grip. Made by MAE, the new digital dashboard of the KTM FREERIDE 250 F with integrated warning and indicator lights offers a multitude of features and is easy to use. For model year 2018, the speedometer cable gains the additional protection of an integrated channel in the braided front brake hose tube. The long, narrow seat combines unrestricted freedom of movement with excellent comfort. It is easily unlocked and unlatched for access to the tank, fuel filter and electrics. 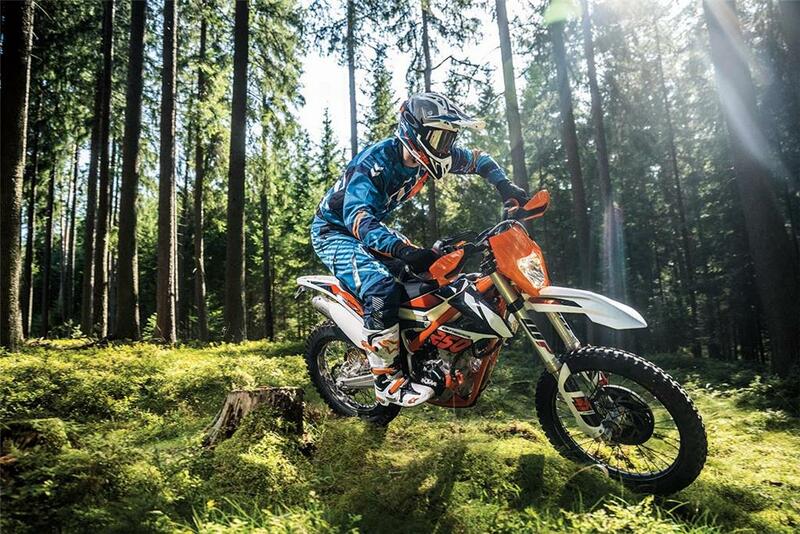 At a seat height of just over 900 mm, the new KTM FREERIDE 250 F offers safe ground contact, even in difficult terrain, especially useful for instilling beginners with confidence and a feeling of safety. An alternative seat with an even lower seat height is available through the KTM PowerParts accessory program. For everyday riding, there is now an ignition lock mounted on the KTM FREERIDE 250 F located on the right hand side of the headlight mask and easily accessible next to the dashboard. Made from transparent polyethylene, the fuel tank beneath the seat is well protected between the upper frame rails. A capacity of approximately 5 l is sufficient to achieve a practical range thanks to the highly economical 4-stroke engine with its high-tech fuel injection system. Behind transparent material, the fuel level is visible at a single glance, while a low-fuel warning light in the dashboard gives an additional warning. Easily accessible and well protected, the air filter cartridge is housed at the rear of the fuel tank at a height that provides the new KTM FREERIDE 250 F with an impressive wading depth.